A combination of rising home prices and incomes have helped three Bay Area cities make excellent recoveries from the recession that began a decade ago. That’s according to an analysis by SmartAsset, which ranked the U.S. cities that have recovered the most from the recession on a scale of zero to 100 based on five statistical changes between 2010 and 2016: unemployment rate, labor participation, poverty rate, median household income, and home values. 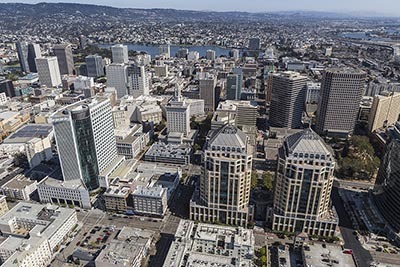 With a score of 96.75, Oakland ranks as the country’s third most-recovered city from the downturn. Since 2010, Oakland home values have grown by 51.7 percent, while incomes have risen by 38.4 percent. Alameda County placed a second city in the top 10: Fremont, which ranks No. 6 with a score of 91.75. Like Oakland, Fremont gets a boost from home price appreciation, which increased by 48.8 percent in that six-year period, while incomes grew by 40.1 percent. San Jose ranks No. 9 on the recession-recovery list, scoring 86.0 and also buoyed by home prices that have risen by 43.6 percent. While San Francisco didn’t crack the top 10, its 44.7 percent income gain since 2010 is the most of any city included in SmartAsset’s study. Fremont’s recovery from the recession is about to get another boost, as Facebook leases two spacious office buildings in the Alameda County city, just across the Dumbarton Bridge from its Menlo Park headquarters. The Mercury News reports that the social-networking behemoth has leased 190,000 square feet of office space in Fremont, enough to house 950 workers. The news comes five months after Facebook announced its intent to build an urban village in Menlo Park, which would include office space, housing, retailers, and parks. Facebook’s Fremont operations will be in the city’s Ardenwood district, where Tesla Motors rented 235,000 square feet of office space earlier this year. Fremont Economic Development Director Kelly Kline told The Mercury News that the city had specifically positioned the neighborhood to attract tech companies and that Facebook’s decision to lease office space there makes sense given its proximity to the company’s Menlo Park operations. U.S. homebuyers hoping to close a sale need to act quickly in the current market, as inventory shortages guarantee that attractive properties take little time to find a buyer. Citing data from the National Association of Realtors, CNN Money reports that the average U.S. home currently sells in a median 21 days. Five years ago, homes lingered on the market for 77 days before selling. In the nine-county Bay Area, homes sold in a median 20 days in October, according to the California Association of Realtors’ latest home sales report. Santa Clara and San Mateo counties had the fastest pace of sales in the state, with homes leaving the market in nine and 11 days, respectively. Mortgage rates ticked down last week but are likely to head the other way in the coming months, as the Federal Reserve is virtually guaranteed to raise interest rates again later this month. Freddie Mac said that 30-year, fixed-rate mortgage rates averaged 3.90 percent for the week ended Nov. 30, down from 3.92 percent the previous week and 4.08 percent at the same time last year. Fifteen-year, fixed-rate mortgages also fell on a weekly and annual basis to 3.30 percent. In a statement accompanying the report, Freddie Mac Chief Economist Len Kiefer said that short-term mortgage rates increased last week based on the near 100 percent probability of the Fed raising interest rates soon. Pacific Union’s recent San Francisco Bay Area Real Estate and Economic Outlook projects that mortgage rates will end the year at 4.0 percent and gradually increase to 4.8 percent by 2020.